Macaroni Salad with Prosciutto – a simple macaroni salad with crispy prosciutto, lots of pickles, roasted red peppers and olives. Perfect for picnics or summer barbecues. I’m back with one of my favorite macaroni salads and I made it with some crispy prosciutto which gives it a really nice crunchiness to this salad. 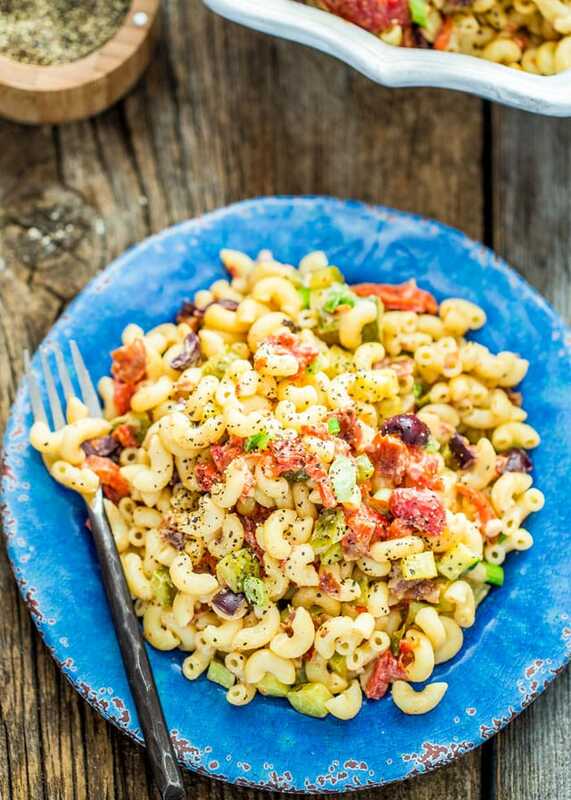 The salad itself is adapted from Pioneer Woman’s macaroni salad, which I love because it has pickles and olives and roasted red peppers, some of my all time favorite ingredients. 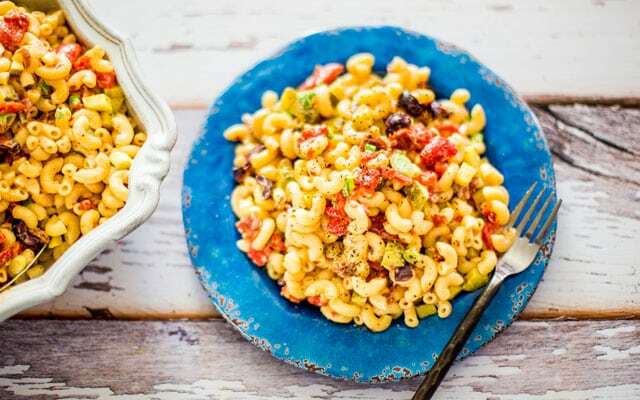 This macaroni salad is the perfect salad for picnics or for your summer barbecue. I used to buy macaroni salad all the time from my local grocery store, until one time I started making it myself and realized how much better it tastes when you make it yourself and it’s nice and fresh. You can also make your macaroni salad as creamy as you like, by simply adding more mayonnaise and pickle juice for that extra tangy flavor. It’s all up to you and how tangy you like your macaroni salads. I love mine extra tangy that’s why this salad is right up my alley. I only added 1/2 cup of mayonnaise here so it may not seem as creamy, trust me it didn’t need to be any creamier because it was really great. And did I say I love that extra crunchiness from the prosciutto? If you loved this recipe, try these! I also made another video for you guys to enjoy, so happy watching and happy munching! 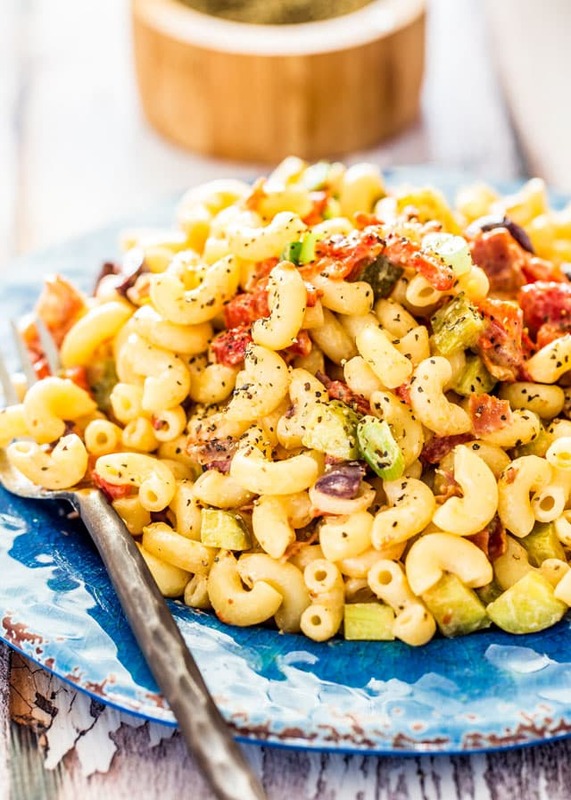 Macaroni Salad with Prosciutto - a simple macaroni salad with crispy prosciutto, lots of pickles, roasted red peppers and olives. Perfect for picnics or summer barbecues. In a small bowl whisk together the mayonnaise, vinegar, salt and pepper. Add a bit of pickle juice, as much as you want, milk and whisk well. Add more milk if needed, the dressing should be pourable. Cook the prosciutto in a skillet until crispy, you shouldn't need to add any oil to the skillet. 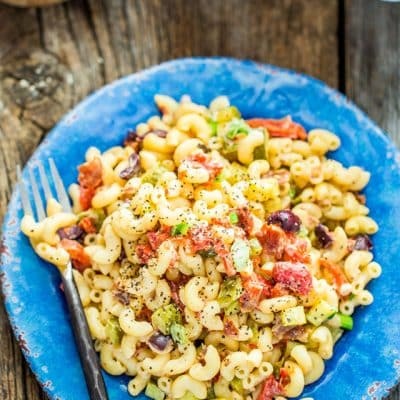 In a large bowl, toss together the cooked macaroni, crispy prosciutto, olives, pickles, roasted red peppers, green onions and dressing. I used dill pickles for this recipe but you can use whichever type you prefer. To get the prosciutto crispy, fry in a pan on medium-high heat for 2-3 minutes. Refrigerate leftovers in an airtight container for 3 to 5 days. Thanks. Small town grocery store. Hard to find good pickles. Any brands you prefer? Making this tomorrow for Father’s Day. Dill or sweet pickles in the macaroni salad recipe?